Hello there! As the title hints, this post is about solving false alerts being generated in SCOM for non-existing clustered VMs / resources. I have recently come across a situation where in SCOM I see lot of false alerts generated for hyper-v 2012 r2 clustered resources; reporting VM resource groups are in critical state. However the VMs are deleted from cluster, so the cluster resource monitoring MP should monitor only what actual resources exist on the cluster. “Alert monitor” generated alerts for deleted cluster resources must be closed manually in SCOM as the monitor keeps checking about the non-existing resource to see it state change update., and even after doing this, the alerts for deleted VMs keeps coming back in console. The whole problem started when couple of cluster nodes in hyper-v cluster are set in Maintenance mode for some activity and the hosts were shutdown as part of process, and during this period, couple of VMs were deleted using VMM management server, and those VMs were gone from cluster as expected, however SCOM picked data from online cluster nodes and was not able to pick data about the deleted VMs from offline cluster nodes. When the shutdown hyper-v hosts were brought online, SCOM started behaving weird, it is still thinking deleted VMs are with the shutdown hyper-v hosts and generated lot of false alerts for deleted VMs in SCOM reporting VMs are in critical state. At this point, the data with the SCOM in its database is inconsistent. There is no way to remove a clustered resource from cluster management pack view dashboard. We can only place the resource group in MM. To solve this bug / data inconsistent behavior with SCOM, cluster monitoring Management packs must be deleted and we have to import the cluster monitoring management packs again – this needs to be done when all cluster node are brought back online and active in the cluster, so MPs can pick the data from all Hyper-v nodes. Any custom management packs created depending on the cluster MPs needs to be exported from Administration view of SCOM and after deleting all Cluster MPs, and re-importing MPs back in SCOM along with custom MPs will fix this issue. It will take about 1 hour or more to pick / update status of clusters. If your PC / laptop is taking ages to shut down/reboot, there are multiple areas that we need to focus on in checking to identify the root cause and fix it permanently. In this post I am going to show you the common areas to look at when you are in such situations. First thing to start with is to fire up the Task manager and identify the resource utilization from the moment you initiate shutdown/reboot. Speaking in context with Windows 8 and 10 versions, launching Task manager will land you at Processes tab by default unless you chose fewer details; if so, click on more details and this will land you at Processes tab. Here key areas to look at is CPU, Memory and Disk processes. Active programs accessed during your session are generally accessed using Physical memory (RAM) and the other passive/minimized programs will be moved off to page file based on RAM utilization and availability. So, in our case, active programs data we accessed needs to be written off to Disk to commit the tasks we performed just before hitting that shutdown/reboot buttons/commands. CPU, Memory & Disk resource utilization are heavily dependent on the programs those you accessed during your session and background programs those run as part of OS/software requirements. Considering an example, I have launched VMware workstation program which consumed about 56GB of my RAM for its operations. Closing the program will not immediately free up used 56 GB of RAM, because the program itself has child processes that needs memory accessed data be written off/committed to the Disk to save the programs state I have left it at. This is Resource monitor tool (type “resmon” in command prompt to fire this thing up), from this utility you can further check the resource utilizing processes. Take a look at the screenshot above, though the memory usage has come down to 4%, the disk still has read write operations going on it. Sort with “Total (B/sec)” in descending order to see which process is performing operations on disk. In my case VMware workstation uses .vmem files to hold the physical memory of my machine to give those physical RAM resources to Virtual machines I use within the application. Once I shutdown/suspend those VMs running on VMware workstation application, the RAM utilized by the VMs must be saved to disk on .vmem file. This process takes time based on amount of RAM utilized by each VM – the larger VM memory configuration/utilized, the longer time it takes to commit the data off to disk. Similarly, there are multiple child processes/background tasks that runs in the back-end and until those tasks are completed, the system will not shutdown/reboot. These tasks do not appear on “Shutdown preventing programs” because they are actively working to close the session data. There are a lot of other tools we can use to identify the processes those consuming resources, but the first step to start off is with resource monitor. I will keep adding more information on this topic, but if you have any queries feel free to comment and I will try to address them. Sometimes importing VHDX/files into Library server or scanning the Library server share files fails with “Unable to import xxxx. xxxx files can only be imported by library servers running Windows server 2012 or later” Error log looks like below in the SCVMM Jobs. 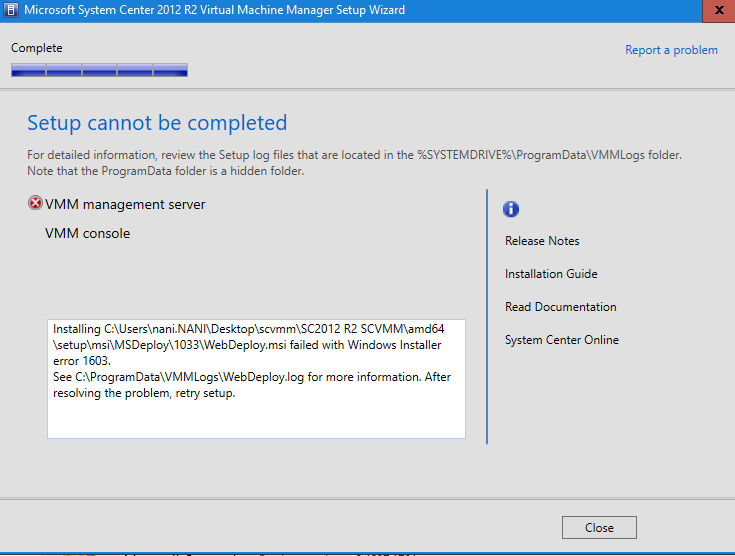 This issue happens when VMM Library server information in VMM Database is improper. 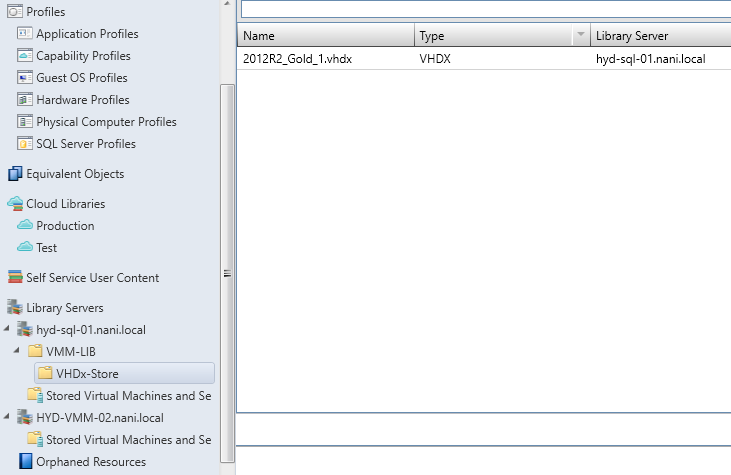 Run below sql query against VMM Database to see the Library server OS information. If above query displays concerned VMM Library server OperatingSystemVersion as “0.0.0.0” then the information is corrupt and this needs to be fixed. Below query displays ”0.0.0.0” info for hyd-sql-01 vmm library, so this must be updated to fix the library issue. 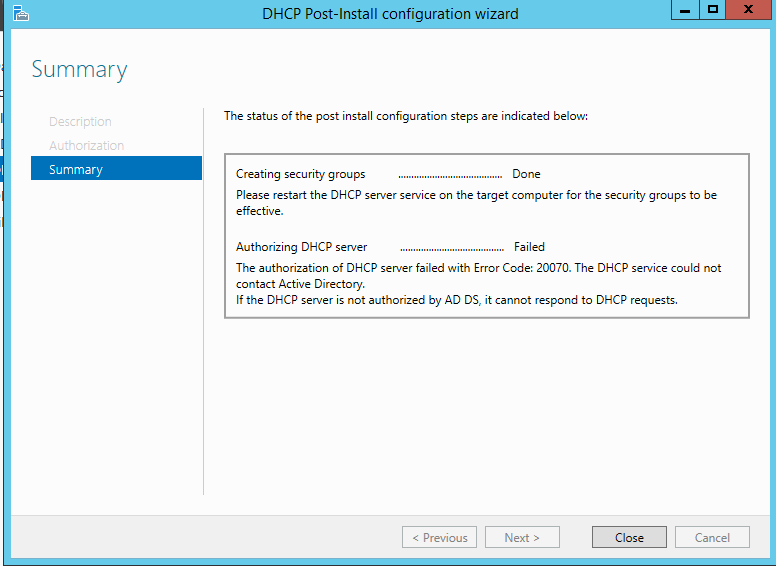 Next, update the table ADHC_Library with appropriate Operating System version of your Windows server. You can get the OS version of the server using below command in cmd prompt. For example, my server is 2012 R2, so I have updated table with “6.3.9200” as below. This will fix the library import issues. This should now help fix the import issues. VHDX/files can now been seen in library shares we’ve configured. As highlighted above, it reports A newer version of Web Deploy was found on this machine. To resolve the installation issue, you must navigate to Programs and Features and uninstall the Web Deploy from there. Once this is uninstalled, you can retry the SCVMM installation and it must pass the web deploy issue now. The reason why a newer version exists can be related to either SCVMM 2016 has been previously attempted to install on this system, or part of web deploy components have been installed for other application requirements.